Agroforestry is on the up. Following the success of the national Agroforestry Conference at Cranfield University organised by the Woodland Trust, Soil Association and the Royal Forestry Society last month, we would like to tell you about the very timely start of our new project, AFINET, in January this year. AFINET (Agroforestry Innovation Networks) is an exciting new European agroforestry initiative which aims to support innovation through enhancing knowledge transfer between farmers, foresters, researchers and advisers. In the UK, the AFINET project is led by the Organic Research Centre and Abacus Agriculture. Over the next couple of years, we will be working with the Farm Woodland Forum to develop a UK agroforestry network. The network will bring together practitioners, researchers and innovators who share a common interest in agroforestry. We will be organising a series of practical events on farms across the country tailored to the interests and needs of the network. Through these events the project aims to identify and hopefully fill some of the gaps in current knowledge, to share ideas that work well and to identify opportunities for innovation. We would like to invite you to be part of this UK agroforestry network. To begin the process we have designed a short online survey to enable people to join the network and to help us identify the key factors influencing agroforestry innovation. The survey will be open until September and then we will use the responses to guide the content for a programme of practical workshops. These will be organised on farms and provide an opportunity for network members to share their experiences. Through these workshops we will also aim to offer support and training where appropriate for specific subject areas (for example tree management) as well as provide a matchmaking service for those with similar interests. If you are willing to answer a few questions to help shape the AFINET project please complete the survey. The first AFINET workshop was held as part of a tree fodder day at Elm Farm in May. Key discussions included market opportunities, such as selling tree fodder as a premium product to horse owners, the mechanisation of harvesting, and the potential trade-offs and synergies in managing trees for multiple objectives (i.e. wildlife, fruit, fodder, timber or fuel). Questions raised included: How much tree fodder must a sheep ingest for a meaningful effect on parasites? Which tree species, arrangements and management methods work for different farming systems? What are the nutritional characteristics of different tree species and how does this vary between varieties? And perhaps most importantly, do the potential health benefits translate into an economic advantage? Upcoming planned events include agroforestry for growers at Tolhurst Organic on the 19th September and a silvopastoral workshop in Scotland in September. Join the network! Watch this space for more exciting opportunities to learn and communicate with the agroforestry community in the UK. 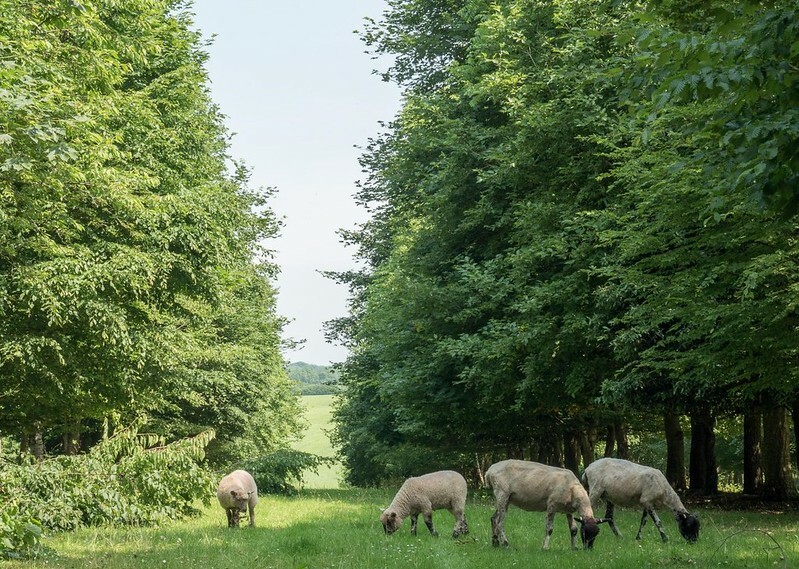 Connect with the Farm Woodland Forum on Twitter and Facebook and explore the website here. Explore the AFINET project website here. Sally Westaway works for the Organic Research Centre as an agroforestry researcher. Explore agroforestry-related resources and blogs on Agricology here. Some of the farms featured in the Agricology farmer & grower profiles are also exploring the use of trees. Have a look at Stephen Briggs, and Ian Harris.